Target Corp. is looking to a new rewards program and steady expansion of its Shipt online delivery service to help tighten ties with customers. The discount store chain kicked off a pilot of Target Red, a cardless loyalty program, in the Dallas-Forth Worth area this week after previously announcing plans to test it starting in April. Also on Tuesday, Target and Shipt said they plan to go live with same-day delivery of groceries and thousands of other products later this month in the Tuscon, Ariz.; Albuquerque, N.M.; Las Vegas; and Reno, Nev., metropolitan areas. Target Red offers customers who enroll 1% back on each purchase, which can be redeemed at a later shopping trip. Members also can vote for local organizations to help direct Target’s community giving. Sign-up for Target Red also can save customers 50% off a first-year membership on same-day delivery with Shipt and make them eligible for free next-day delivery of everyday essential items through the Target Restock service, which normally charges $4.99. 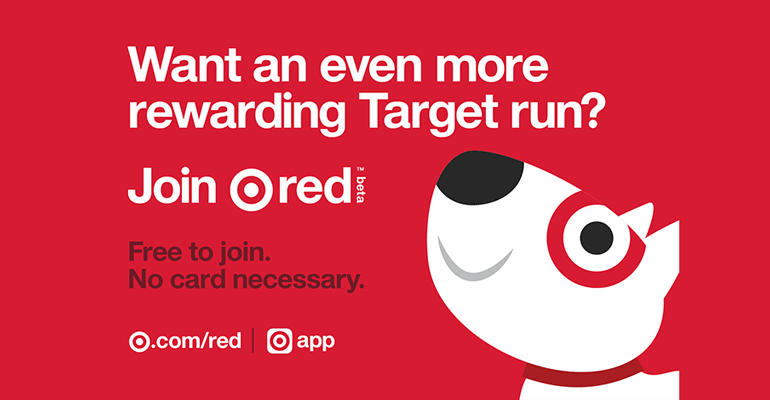 Starting this April, Target guests in the Dallas-Fort Worth area can enroll in Target Red, a new pilot loyalty program with exclusive benefits. Dallas-Fort Worth customers can register for the Target Red via the Target app. Once enrolled, they can start earning and redeeming rewards online or in-store through the app’s digital wallet tool. Current Target REDcard holders — who get 5% back on all purchases and free shipping on Target.com — also can sign up for Target Red, but the 1%-back perk isn’t stackable with the 5% discount. Meanwhile, Target and Shipt are scheduled to begin same-day delivery more than 55,000 groceries, essentials, home, electronics, toys and other products in Tucson and Albuquerque on April 24 and in Las Vegas and Reno on April 26. The launch will give over 500,000 households in Arizona and New Mexico and 2 million-plus households in Nevada access to Target products delivered by Shipt in as soon as an hour. New members who sign up before the service gets under way can get an annual membership for $49, a savings of $50. “Same-day delivery was at the top of our list when we were thinking about ways to make shopping at Target even easier. Shipt’s personalized, customer-focused approach fits perfectly with our commitment to deliver a convenient, exceptional experience,” stated John Mulligan, executive vice president and chief operating officer at Target, which acquired Birmingham, Ala.-based Shipt in December. Shipt plans to add more than 500 shoppers in Arizona and New Mexico and over 450 in Nevada to fulfill the online orders from Target customers. About half of Target’s stores are expected to be participating in Shipt same-day delivery through the early part of 2018, with most stores offering the service by the 2018 holiday season. Target said Shipt’s service will be in nearly 180 markets — reaching 80 million households — by the year’s end, and same-day delivery will be available for all major product categories at Target by the close of 2019.